I read this article and found it very interesting, thought it might be something for you. 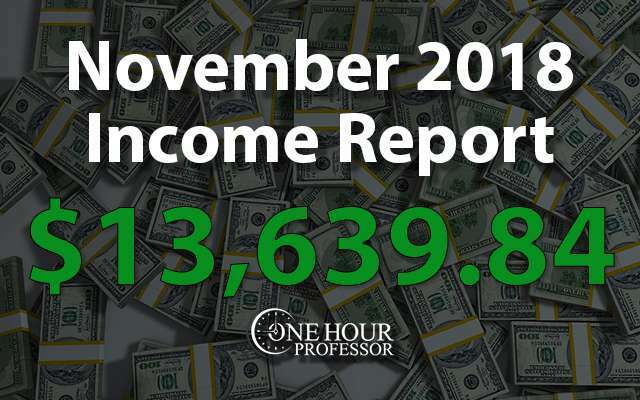 The article is called November 2018 Monthly Income Report and is located at http://www.onehourprofessor.com/november-2018-monthly-income-report/. Another month down, and it was a good one. Not a record breaking one, but I’m getting a lot done and feel good about where my online business is at. This was an especially good month considering I made one of the dumbest mistakes I’ve ever made since starting my online business. To sum it all up, I added a no index tag to one of my websites in the staging environment and then pushed the website live without removing the fact. In layman’s terms, this means that I instructed Google to De-index my entire website, yes, meaning REMOVE IT from the search engine, and obviously that hurt my earnings. I was able to recover, but it was a sucky week and a half. More details about this in the report. This month my total income after expenses was $13,639.84 which comes out to $454.66 per day. I figured out how to recover from a self-inflicted SEO catastrophe. Pageviews for the CK website increased by 26% in the month of November. This is in addition to the 34% increase I saw in October, which means that in the last few months traffic has increased by over 50%. November was a whirlwind from a personal standpoint. I was able to close on our new house on November 30 and I’m proud to say that my wife and I are now proud owners of a beautiful home. I shared a lot about this house in the last income report, so I won’t do it here again, but we’re very excited. The closing itself took quite a bit of time in November because I was filling out endless piles of paperwork to make sure I was able to get approval for our loan. And while I’m not sure how many hours this took away from my work, it was definitely significant. Aside from that, just the stress of getting a new home and all of the work that goes into it took a bit of a toll on me. But, now everything is done and I’m incredibly happy that we got the home and can work on our remodeling efforts. While I’m not sure exactly how much time I’ll spend working on it in December, I can tell you that I’ve already put in quite a few hours completing some landscaping before it gets too cold. I’ve noticed I’m having a really hard time not putting in 12-15 hour days working on the house. I’ve realized that I’m very impatient when I have tasks to complete and I tend to fixate on getting everything done as quickly as possible. While I think this is a great quality to have in some aspects, it can also be very difficult to manage multiple things at once because I’m always stressing about getting the next thing done. Though our house is nice on the outside, we have quite a bit of work that we want to do on the inside so the projects are nearly endless. But I’m going to work on juggling all this in the month of December and I’m hoping that I’ll be able to get a lot of it done while still running the business. I know I’ve said this before, but the fact that I have a passive income business is incredibly helpful in moments like this. A few days back I spent roughly 10 hours doing yard work to get rid of some bushes and trees that were needing to be cut down and trimmed, but when I came back home at the end of the day my earnings didn’t suffer at all. It’s truly a blessing to have a business like this and the fact that I been so successful thus far seems surreal. 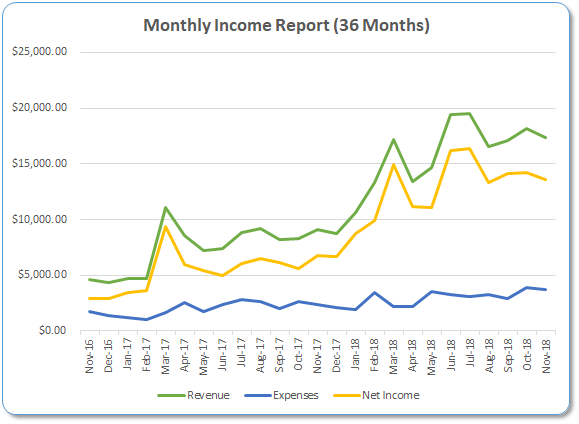 Udemy Income: Staying consistent with years prior, I saw an increase in earnings in the month of November and I have no doubt this has to do with black Friday. After seeing how good I did this month, I looked back in the past and saw that this is a very typical spike that you see this time year. While it was only just over $200, that’s almost a 100% increase from the prior month and I’ve done absolutely nothing to make it happen. Obviously, I’m pretty happy about that and give kudos to the Udemy team for their marketing efforts. OHP Website: There were quite a few random affiliate purchases this month which increased the amount of revenue that the OHP website made. Beyond that, I also saw that for some reason there were more purchases of Thrive Themes than usual. I didn’t do anything to make this happen, so I just assume that it had to do with the holiday season and their own marketing efforts. CK Website: This was the highest earning month for the CK website at about $386 and this was a 21% increase from the prior month. While it still isn’t a ton of money, it’s good to see that the trend here is moving upward and revenue continues to increase. JFTHQ Website: This is an outlier for all the wrong reasons. 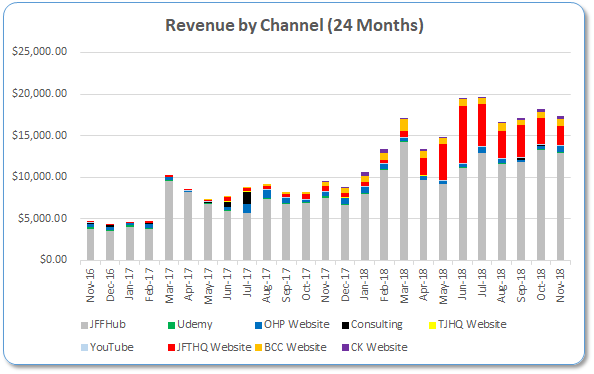 There was a 26% decrease in revenue generated from this website in the month of November and while it was entirely my fault, it was a hard lesson learned. Calendar Printing Services: I had some additional printing costs for the calendar because the original run that they completed didn’t turn out correctly. This is partially my fault and partially their fault. I approved their file and didn’t notice that they had two months of June in the calendar itself. Also, I had to pay a little bit extra as my original order wasn’t for the right calendar size. While this is more than I would’ve liked, I still think we can be profitable with this item on Amazon. I don’t want to call it a winner yet, but the calendar has been doing pretty well so far in the month of December. NeverBounce: This is a service that I use to review the email addresses that I’m going to complete outreach to for link building prior to sending any written emails. This is really important because the more bounced emails you have, the lower your deliverability rates are. And once people don’t see your emails, your link building efforts really suffer. If any of you are trying link building at scale and using email outreach to try to acquire those links, I highly recommend this service as they make the process very simple. Just upload a list of target emails and they will clean the list for you and let you know which ones are the bad apples to pick out of the bunch. Full Portfolio Update: For my portfolio as a whole, I don’t have any big changes that I made in the month of November. While each website is dynamic and continues to change month after month, there were no sweeping adjustments made. JFFH Update: I saw a 6% decrease in traffic for the month of November, but I don’t attribute this to anything specifically. I noticed last year that this time of the year tends to be a little bit slower for this website and while I don’t know exactly how much slower it’s going to be, I expect to see traffic fall a little bit in December as well. Consulting Update: I didn’t have a consulting call this month, though I do have a potential long-term client reaching out to me presently. I’ll let you know how that worked out in my next income report. Udemy Update: It was great to see the earning increase here, but it was completely out of my control and I’ll give kudos to the Udemy team for driving more sales. OHP Website Update: I still don’t have news here and I’m not going to promise anything. My partner is no longer dealing with her personal issues, but she did get a promotion at her FT job and is pretty busy with that at the moment. That’s fine with me, I’m in no hurry to get started with the podcast as I have enough on my plate currently. JFTHQ Website Update: Man, oh man, I really f&#ked up with this website in the month of November. As I mentioned in my intro, it all came down to me adding a no index tag on the staging website. Basically, whenever I roll out any large updates to any of my websites I first do a staging version of the website. This is a website that Google should never see and is an exact replication of my current website. The idea is that I create this website and test out all of the changes prior to pushing anything live. This is exactly what I did and we made some pretty major updates that I think make the website much better. But, the problem was that I had a tag on the website telling Google that it should no longer index any of the pages. I did this to make sure the staging version of the website wasn’t showing up in Google results. Without realizing it, I pushed this version of the website with the no index tag live and my traffic absolutely tanked. Obviously, when I saw this happening, I was in a panic. You have to understand that at first, I had no idea what was happening and I thought that my website was penalized from Google. But then, I remembered that we had just completed a new update to the website so something had to be off. While I don’t think that I’m 100% back to where I was, I think that I’m about 95% of the way there and considering how bad it was, I’m happy with that outcome. To recover from this absolutely stupid mistake like this, all I had to do was remove the tag and resubmit the site map index Google Search Console. Once I did that, Google took care of the rest. Double and triple check website updates. Moving forward I’ll always check specifically if I have a tag added to the website. Backlinks are coming more easily. While it isn’t reflected in this report, I’ve noticed that many of my link targets really like the revisions that I made to the website and are more willing to link to me as a resource. This is incredibly important and I think that the total number of back links will increase significantly by the end of December. Not a whole lot to report for the month of November. There was a nice increase in referring domains and that’s because I have a link building strategy built into the website that continues to work. One of the cool things that I’ve been able to do for this website is mostly related to the calendar. Right now, if you go to Google and you search “Best Calendar for WEBSITE TOPIC”, my website is the number one Google search result. If you go to Amazon and search “WEBSITE TOPIC Calendar”, my website is the number one search result. Aside from all of this, I have a very large and engaged Facebook audience of about 16,000 people who I’m pushing to purchase the calendar as well. All of this is leading to me being the industry leader for this particular type of calendar and while I’m not sure how it’s going to end up selling through the end of the month of December, this is exactly what I’d like to do with other physical products that I create in the future. I’ve talked numerous times how I’d like to get onto Amazon as a seller because I’d like to diversify into physical products, and if I’m able to monopolize all of the search engines like I have with this calendar, it’s very likely that I’m going to create multiple revenue streams for years to come. Referring domains had another nice increase and earnings also increased. All of this helps the traffic maintain and keeps this as one of my steadier projects that I’ve worked on. This website continues to grow and I think that I’m starting to see a little bit of a light at the end of the tunnel. While I’m still not exactly where I want to be, all of the link building that I’ve done here seems to be having a positive impact on the website and I continue to see growth in both traffic and earnings. The referring domains continue to increase and though we finished the outreach for one of the databases, I have another one being built right now which should equate to somewhere between 50 to 100 additional links. Once that’s done, I’m going to look into additional link building ideas and continue to try to increase the authority of this website for the next few months. I’ve mentioned numerous times how we did product review writeups for this website and they didn’t rank. Well, those keywords I wrote about are now on page 3 and page 5 Google search results. While this isn’t getting me any traffic or commissions, it’s a significant increase from what they were previously and this is a very positive thing to see. While I continue to build links, I’m also working to write two more review type of posts in an effort to see if a newly published articles can rank well. I’ve also changed my strategy a little bit. Now I’m looking at some of my weaker competitors and seeing what they’re website is ranking for. Once I see a keyword that they rank for that I think I can make something better than, I’m pouncing and trying to outrank them on Google. By the end of December I’ll definitely know if this works and if it does, you can bet that I’ll have my writers writing more and more review type of content in an effort to further monetize this website. Patience and persistence are still king. It took over a year for me to start to see any real movement on this website, and now you’re seeing that things are growing pretty significantly. Over the last two months I’ve had a 50% increase in traffic and I don’t see that stopping. This isn’t due to new content, it’s due to the fact that Google is beginning to give me better placement based on my previous efforts of content generation and link building. Check and double check before major updates: I should have known this already, but before you ever do a major update on your website, really make sure that you check all of the things you change so that you can avoid an issue like I had. While I was able to recover, this was definitely something that hurt my online business for the month and if Google wasn’t willing to quickly change things, I’d really be hurting right now. Monopolizing Search Engines is Amazing: Not to say that I’ve done this multiple times, but the fact that I’m able to rank number one in Google and Amazon for the calendar that I’m trying to sell is pretty amazing. I’m not sure exactly how large of a producty this is going to be, but anybody that’s looking for this type of calendar during the holidays is going to find me and it’s pretty awesome to know that I was able to do this. Now, if I can do this with Evergreen products, it’s very likely that I’ll be making a healthy sum from each Amazon product that I launch in the future. Houses are time consuming: This has nothing to do with my online business, but owning a house is turning out to already be a lot of work. I don’t really mind this because it’s mine, but I’ve already spent a good 15 to 20 hours doing various tasks at the house with no end in sight. I was able to get the calendar up and for sale on Amazon. Not only that, I was able to get a quick increase in sales from the beginning, which led to me being ranked number one when people search for this type of calendar. I really wanted to step back and think about my business in the month of November, but with the house closing that just wasn’t possible. The next few months are going to be busy and it’ll be interesting to see how I balance my business and the house itself. I really wanted to do this in November but then I realized that I’m making a pretty foolish beginner mistake. Now that I’m seasoned, I’m a big fan of just in time learning. What this means is that I only learn about something just before I’m about to implement it in my business. While I could focus on understanding Pinterest now, the reality is that I’m a few months away from implementing it in my business so I need to hold off until I’m ready to actually implement it. I intend on training my virtual assistant on how to create a Pinterest following as well, so this is a large project. I mentioned it above, but I really want to make sure that I publish a few new review type blog posts on this website in the month of December. Now that the website seems to be growing organically and I have quite a few links, I’m hoping that reviews that are low competition will get ranked pretty quickly. If they do, I can quickly ramp up the earnings for this website. Setting year-long goals is something I’ve done since I started my online business and when doing so, I like to sit back and really reflect on the year itself. In 2018 I was able to grow my business by over 100% (second year in a row) and while I’m hoping I’ll be able to do that again in 2019, it could be a pretty lofty goal. That all said, I definitely want to take some time to think about it. Relaxing and working on the house sounds like an oxymoron. Most people would say you can only do one or the other, and not both. For me, believe it or not, I find some of the work that I have to do around the house relaxing as it feels good to complete something that is a part of the home that you own. I’m sure I’ll get sick of this eventually, but I want to take time in December to work less on my business and work on my home more to make it what we really want. Pls send me a link to your calendar, l cannot find it using your suggestions. I cannot do that because it will give away my niche, sorry! But thank you for reading.